"When you're a limited company, you need to know which Tax Office you're dealing with," she explains. "Before, you could search it by postcode. That's just disappeared now." 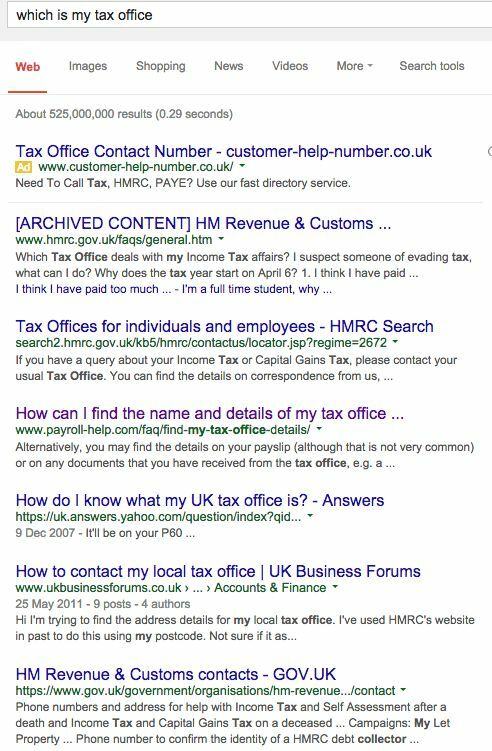 The first organic search result from Google for the query "Which is my tax office" is actually the old, mothballed HMRC pages – millions have been stuffed on the National Archive's website. But beware anyone who uses them, she warns. Tax offices change, so anyone dipping into the dormant site is taking a risk. "The old site is not being updated, and this could be dangerous." Now, wait: the third link appears to be hosted on GOV.UK. But this is actually a random dump of links. And after scanning it for several minutes, you'll be none the wiser. All this means that you now have to make a phone call to make sure which your tax office is. This is an example of what was until recently a fully functional, easy-to-use digital service reverting to a primordial, analogue state. Another non-obvious example of user confusion is caused by a surprising omission from the the GDS generalists. "It sounds pedantic, but it's important. One user said to me, 'I can understand it now, but it's giving me the wrong advice. This is misleading and it's a step backwards'. You need to give people the right advice, especially if we want more people using it." Taxpayers and accountants were dismayed to discover from our GOV.UK feature this week that very little work continues on the GOV.UK transition. The GDS has ruined hundreds of websites ... and moved on. At its height, the project employed some 200 staff – but many have since moved on. The GDS management team's attention is now elsewhere – they have discovered a new mantra – "Government as a Platform" – and they're busy trying to create a work programme to fulfil it. And the budget that goes with it. 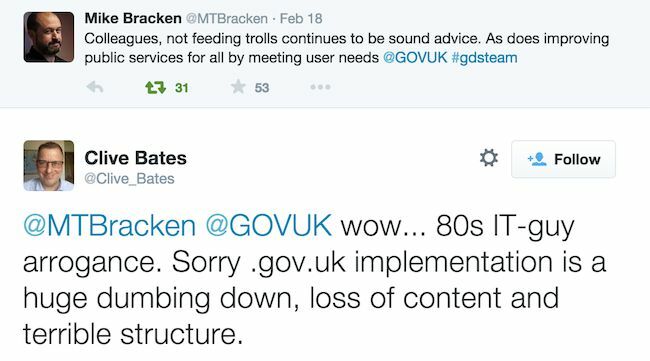 GDS insiders tell us that Clark has been blacklisted by GDS – and today GDS chief Mike Bracken blocked her on Twitter, before advising his staff "Don't feed the trolls". How that advice squares with the "Users Come First" mantra is a puzzle. Perhaps only some users come first. The rest, "the trolls", can be ignored.